The Antidote reservoir from Camelbak is a 103 ounce (3 liter) tactical bladder designed specifically to fit the smaller footprint of the armor- and plate carrier. They achieved this by widening and flattening the reservoir. While that makes the reservoir fit the carrier about a 297% better (scientifically proven; nobody would ever make up a number, right? ), a brand new reservoir requires a brand new carrier to fit its unique shape. 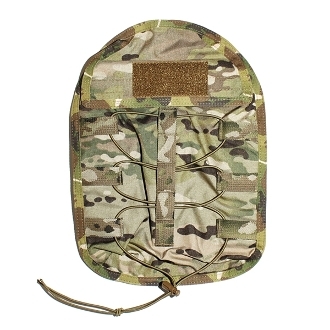 To keep the weight to a minimum, we offer the ATS Antidote Hydration Carrier in 500D and Multicam Litelok. In 500D, the carrier weighs just 5 ounces, and the Litelok version weighs about 3 ½ ounces without the reservoir. The face of the carrier has our familiar elastic shock cord to secure lightweight items like jackets and gloves. There is a drain grommet in the bottom of the carrier and the face of the flap has a soft side (female) Velcro panel for placards or morale patches. The lid is held closed by 1½inch Velcro, and there is a hanger tab in the top center to suspend the reservoir from. The AHC is about 14½inches long and 10 ¼ inches wide, and uses 6 channels and 6 rows of MOLLE space.